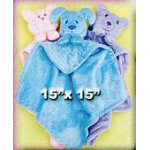 These handkercheifsized blankies are cuddly soft made up in Minkee, flannel, fleece or cotton. The 15" pattern includes a kitty, bear and puppy design. A must have for your toddler, baby or grandchild. Faces available on CD for embroidery machines 562228.